A heavily debated topic in the cloth diapering world is whether one-size diapers or sized diapers are superior. One-size diapers are the most popular cloth diaper on the market today, and are advertised as fitting babies from birth to potty training. Normally the diaper is adjusted by snapping down the front rise snaps or depending on the diaper could be adjusted by tightening the elastic inside the shell. In my experience most one-size diapers were far too large for even my 9lb newborn and seemed to fit starting around 12 lbs. However Rumparooz and Fuzzibunz seemed to run smaller and both fit Grace at birth. Popular one-sized diapers include BumGenius , Fuzzibunz One Size , Rumparooz , Charlie Banana , and Blueberry Diapers . Sized diapers, on the other hand come, in sizes like small, medium, and large. They tend to offer a more custom and trimmer fit due to the less material that is used. However, you will need to buy two or three sets of diapers to diaper your child from birth to potty training. Popular sized diapers include, AppleCheeks , and FuzziBunz Perfect Size . So Which type of diaper is best for you? See the chart below to help you decide. 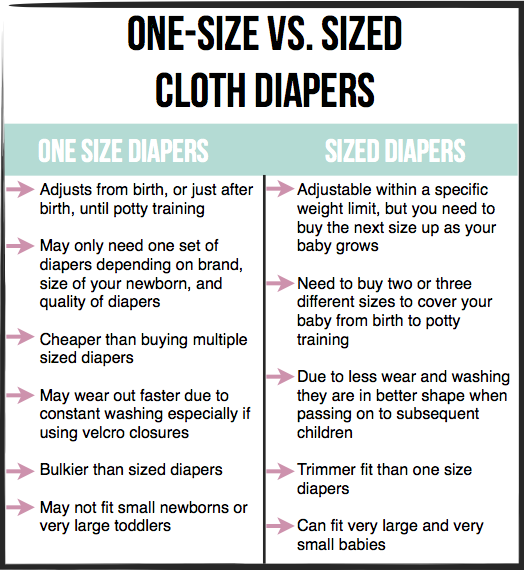 So, cloth diapering mamas which do you prefer?